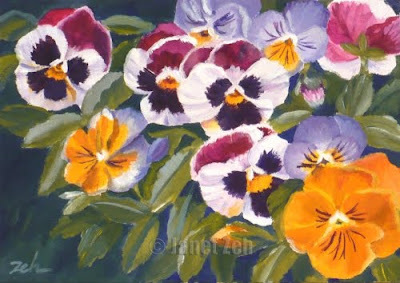 Bright and colorful pansies are a cheerful sight anytime! These were as fun to paint as they to look at. Something about pansies always makes me smile. This original oil painting is done on archival panel size 5"x7". You can see this or other small paintings in Zeh Original Art Etsy shop. Thanks for stopping by and have a happy day!